Globalizm Inc has evolved from the vision of collective excellence of life fueled by our conscious evolution as a species capable of self reflection and conscious choices. BEing the change! WHY : The state of the world is merely a reflection of what is within each of us as individuals. If each of us lives conscientiously, carefully considering our day to day choices and the impact we are having on other living beings and the planet, then the world would inevitably shift towards being more congenial and harmonious. When we are in harmony with the universe living with awareness in the moment, we are also able to live up to our highest potential, and contribute positively to the world at large. Imagine what the world might look like if all 7 billion humans alive were to live in this manner! We – you and me – have the potential to accelerate towards a more peaceful harmonious world through our individual and collective transformation and action. 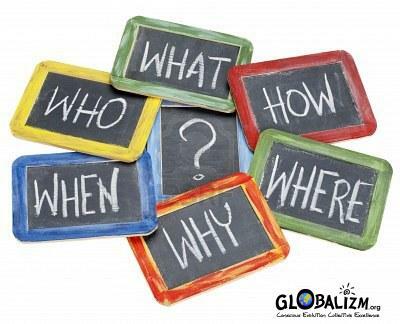 WHAT : Globalizm Inc seeks to educate and encourage children and adults alike to live consciously and strive to live to their highest potential through initiatives for personal and collective transformation. HOW : With Conscious Evolution towards Collective Excellence being our core mission, we have developed a collaborative process to examine the pressing issues plaguing our world and take direct or indirect action to make an impact and move the needle forward on the evolutionary clock. Anybody who is concerned about social issues and wants to make a difference may participate. While the focus is on global topics, the process inherently helps the participants examine their own biases, opinions and tendencies and serves as a means for growing personally into more conscious responsible and compassionate human beings. The process has evolved organically, and will continue to evolve as we discover new ways to further our mission. WHEN : NOW! Now is all there is. Let’s not wait for others to join us – let’s each one of us be the change, right here, right now, in the smallest way possible. That adds up and would have already made a difference. WHO : Anyone who is or would like to be a Globalite! Globalites are Individuals who effect change by living with awareness, making conscious choices recognizing the impact they have as an individual, and utilizing their fullest potential to be the best they can be, and doing their part in contributing to the world in a constructive manner. Sign up on globalizm.org to let us know you are interested. WHERE : We are currently limiting participation to Planet Earth (unless those friendly Martians want to join us :-) ) ! 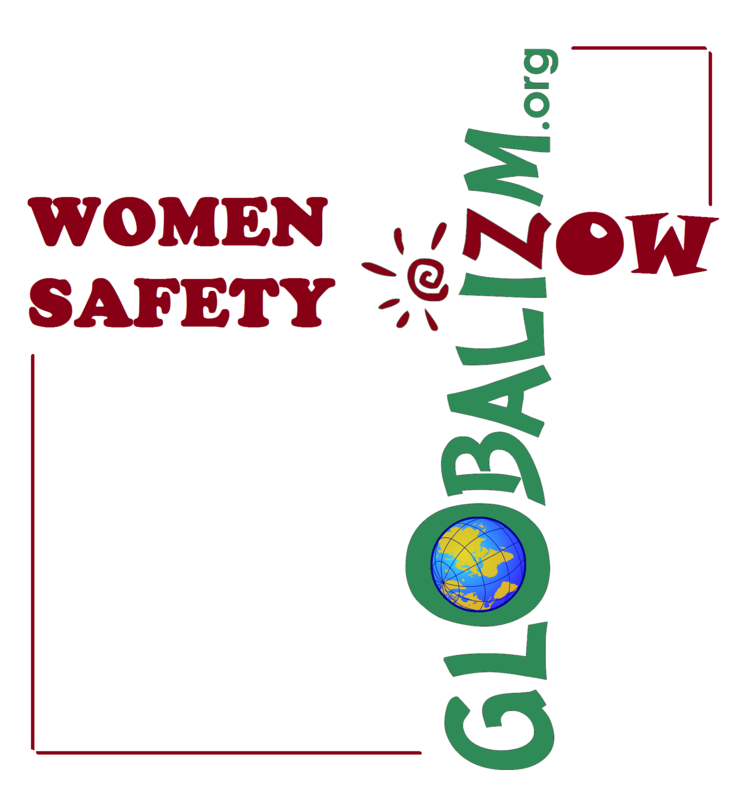 Globalizm invites people from around the world to participate. Many of our activities are conducted online as video conferences, or as discussion forums on our website. So it does not matter where you are! If you are or wish to be a Globalite – join us! 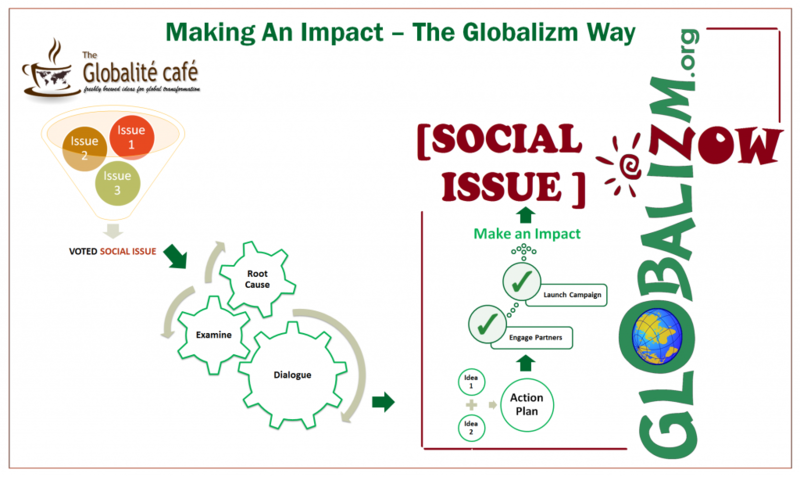 THE GLOBALITÉ CAFÉ serves as a think tank with a difference – rather than applying pre-conceived notions and opinions, the café encourages a dialogue that is objective and based on careful examination of the selected global topic or social issue to determine the root cause of the issue. While the dialogue’s sole objective is to gain a deep understanding of the topic, if solutions emerge and there is enough interest to take action, the topic moves over to the GLOBALIZM NOW forum which is designed to collaborate on an action plan and move forward towards launching a direct campaign, or an indirect campaign by partnering with relevant organizations. The impact is measured and used as input for future NOW topics and campaigns. Here is a visual explaining how Globalizm Inc strives to make an impact. As noted before, this process will continue to evolve organically to be effective in carrying out the mission. 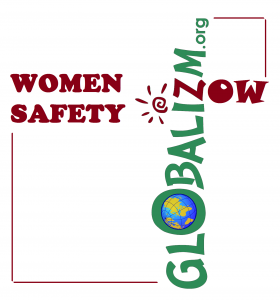 For example, most recently we examined the topic of Women Safety in India and around the world at our café via online video conferences, that resulted in a list of possible solutions. The topic has now moved over the Globalizm NOW forum and will be discussed with the goal of taking direct or indirect action. HOW does one sign up to participate in THE GLOBALITÉ CAFÉ and GLOBALIZM NOW Forums? Join us in helping make a better world for our children. To join THE GLOBALITÉ CAFÉ and GLOBALIZM NOW forums please check out the events section and register for an upcoming forum event. Individually and Collectively, let’s evolve, let’s make a difference! The Cutting Edge of Life!